Sierra Flame manufactures electric and gas fireplaces – including indoor and outdoor models. Sierra Flames ‘all-in-the-box’ fireplace promise includes upgrades which would normally be costly add-ons. 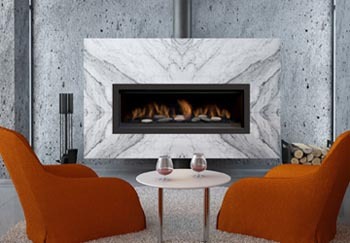 Unlike other fireplace manufacturers Sierra Flame provides quality decorative media like reflective glass, rocks or logs, porcelain panels and remote control in the box right from the factory. The Thompson-36 is direct vent fireplace that can really put out the heat – Measuring only 36″ x 15″, it is a compact fireplace that has on output of 26,000 BTU’s. 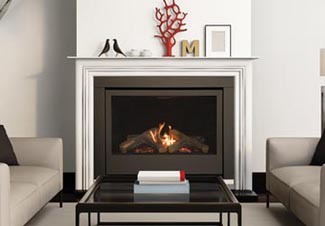 This elegant looking gas fireplace is available in deluxe models only and in natural gas and propane. The Austin features a sleek contemporary linear look. At 65″ it now features our largest viewing area with our signature large flame presentation. The Austin comes standard with our Deluxe system including 7 day programmable thermostat remote, 6 stage dual fan control and modulating valve so you can control the flame.